Starting university for the first time can be pretty overwhelming but between social activities, classes and studying, it’s important to take the time to look after your health and wellbeing. Your new student lifestyle might not always equate to a healthy student lifestyle but by following our top 10 tips, you can ensure you do the best you can!\r\n\r\n1. 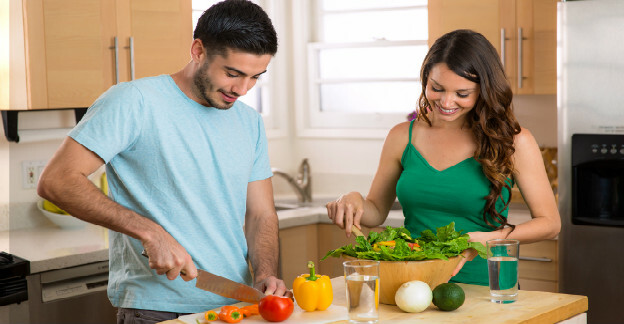 Learn to cook before you leave home: Knowing how to cook a varied and balanced diet will do wonders for you whilst you’re at university. It will stop you eating so many processed meals and ensure you have a healthy diet.\r\n\r\n2. Eat breakfast: It’s important to set yourself up correctly in order to have a productive day. That begins with eating breakfast. Eat a healthy and hearty breakfast to help you concentrate throughout the day and ace your classes!\r\n\r\n3. Join a sports club: Most universities have a gym on campus you can join but a more fun way to get regular exercise, and meet new people, is by joining a university sports club. Find a new sport you haven’t tried yet to give yourself a goal to work towards!\r\n\r\n4. Get enough sleep: Staying up until the early hours of the morning to finish that assignment might be necessary every now and then but you should always try and get a good night’s sleep. Lack of sleep can leave you unfocused, irritable and can make you gain weight. Try and settle into a regular bedtime routine.\r\n\r\n5. Limit junk food: Unhealthy food is quick and easy to consume, especially whilst you’re on the go. But it’s not wise to eat a lot of junk food. Keep healthy snacks around that you can eat on the way to class instead. But do treat yourself every now and then!\r\n\r\n6. Stock up on vitamins: If you can’t always get the nutrients and vitamins you need from your diet, top up with supplements. Boosting your immune system will help you avoid “fresher’s flu” which is a common ailment new university students experience early in their studies, after being exposed to so many new people. Investing in hand sanitiser is also a good idea.\r\n\r\n7. Don’t take too much on: Starting university is filled with so many different opportunities but it’s important to manage your time well. Ease yourself into university life and don’t feel like you have to say yes to everything. At least not right away. Spreading yourself too thin can have a negative impact on your studies which should always be your priority. \r\n\r\n8. Stay hydrated: Make sure you’re drinking enough water throughout the day and limit your intake of sugary and caffeinated drinks. A strong coffee can help you kickstart your morning, but carry a bottle of water around with you during the day. Water is excellent for your mind and body – plus tap water is free!\r\n\r\n9. Register with a local doctor: Most universities will have an on-campus medical centre that you can register at but if not find a local doctor and register there. This will make booking appointments, getting prescriptions and generally looking after your health so much easier.\r\n\r\n10. Learn to manage stress: Tough classes, strict deadlines and a heavy workload can take its toll on any student. Learning how to manage stress in an effective way can transform your university experience. Lots of stress can make you physically, emotionally and mentally drained so it’s important to learn how to deal with it. Having a friend to talk to or quietly meditating are just two excellent ways to relieve stress.\r\n\r\nTaking on board these tips, you’ll learn that a healthy lifestyle for students is possible! « Should You Study In Ireland or The UK?